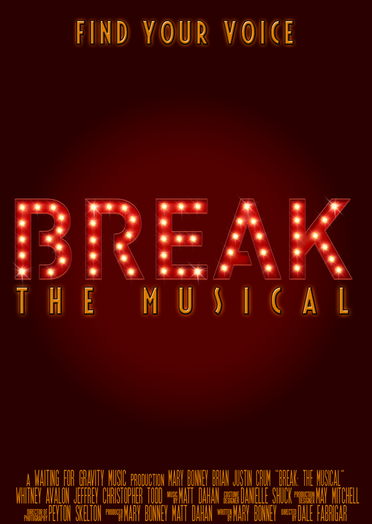 Break: The Musical is a musical web series following Kate (Mary Bonney), an LA music journalist. She lands the interview of a lifetime with her rock star idol Carter Phillips (Brian Justin Crum), who has retired from the spotlight. The pair inspire each other and the interview changes their lives. When Kate's gossip-hungry editor (Whitney Avalon) puts a spin on her article, Kate's integrity is put on the line and she is faced with a dilemma that will either make or break her! Break represents a feel-good series about staying true to yourself and following your dreams, no matter how terrifying that can be. It was inspired by Mary Bonney's experiences working in the music industry for over a decade.